Nothing says summer like that first backyard picnic. Whether it's checkered tablecloths and fried chicken or no tablecloth and tofu burgers, outdoor dining is a treat. 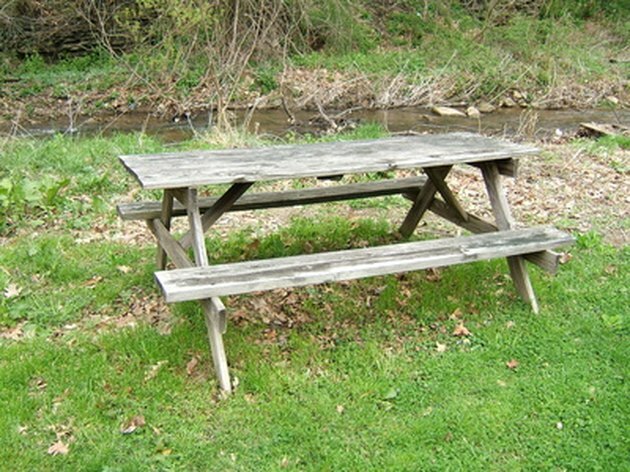 Many kinds of picnic tables are available, from plastic to stone, but wooden picnic tables are the most traditional. Outdoor wood furniture requires a little care, but not nearly as much as some other outdoor furniture. Maintaining your picnic table ensures years of happy gatherings, no matter what you put on top of it. Wooden picnic tables are easy to maintain. Leave cedar tables untreated so that they weather to a lovely soft silver. If your cedar table darkens too much, add 3 cups of bleach and 1 oz. of detergent to a gallon of warm water, and use it to wash the table. Use a brush to apply a wood sealer to keep the color intact if you prefer. Use a little fine sandpaper if the wood splinters at all. Treat redwood tables with a pigmented stain to help retain the rich color. Use a brush or staining sponge to apply it in long, even strokes. Make sure to feather any edges where there is any overlap, so you don't get strange lines of thicker stain. Apply a coat of linseed oil, teak oil or tung oil to unfinished wood picnic tables once a year to keep them sleek and well lubricated. Pour a little oil onto a clean, soft cloth, and rub it into the table, always working back and forth with the grain. Seal unfinished hardwood picnic tables by brushing on a water-resistant, UV-protected sealer. Follow the manufacturer's instructions for drying times. Sealers are available in many tints so that you can get depth of color without having to apply a stain first. Maintain painted wooden picnic tables by keeping them free of dust and debris and cleaning up spills when they happen. A soft, damp cloth is all you need.